For other uses, see Ivory Coast (disambiguation). Ivory Coast or Côte d'Ivoire,[a] officially the Republic of Côte d'Ivoire, is a country located on the south coast of West Africa. Ivory Coast's political capital is Yamoussoukro in the centre of the country, while its economic capital and largest city is the port city of Abidjan. It borders Guinea and Liberia to the west, Burkina Faso and Mali to the north, Ghana to the east, and the Gulf of Guinea (Atlantic Ocean) to the south. Before its colonization by Europeans, Ivory Coast was home to several states, including Gyaaman, the Kong Empire, and Baoulé. The area became a protectorate of France in 1843 and was consolidated as a French colony in 1893 amid the European scramble for Africa. It achieved independence in 1960, led by Félix Houphouët-Boigny, who ruled the country until 1993. Relatively stable by regional standards, Ivory Coast established close political and economic ties with its West African neighbors while at the same time maintaining close relations to the West, especially France. Ivory Coast experienced a coup d'état in 1999 and two religiously-grounded civil wars, first between 2002 and 2007 and again during 2010–2011. In 2000, the country adopted a new constitution. Ivory Coast is a republic with strong executive power vested in its president. Through the production of coffee and cocoa, the country was an economic powerhouse in West Africa during the 1960s and 1970s, though it went through an economic crisis in the 1980s, contributing to a period of political and social turmoil. Only around 2014 has GDP per capita in the country again reached the level of its peak in the 1970s. In the 21st century, the Ivorian economy is largely market-based and still relies heavily on agriculture, with smallholder cash-crop production being dominant. The official language is French, with local indigenous languages also widely used, including Baoulé, Dioula, Dan, Anyin, and Cebaara Senufo. In total there are around 78 languages spoken in Ivory Coast. There are large populations of Muslims, Christians (primarily Roman Catholics) and various indigenous religions. Originally, Portuguese and French merchant-explorers in the 15th and 16th centuries divided the west coast of Africa, very roughly, into four "coasts" reflecting local economies. The coast that the French named the Côte d'Ivoire and the Portuguese named the Costa Do Marfim—both, literally, mean "Coast of Ivory"—lay between what was known as the Guiné de Cabo Verde, so-called "Upper Guinea" at Cap-Vert, and Lower Guinea. There was also a Pepper Coast, also known as the "Grain Coast", a "Gold Coast", and a "Slave Coast". Like those, the name "Ivory Coast" reflected the major trade that occurred on that particular stretch of the coast: the export of ivory. Other names included the Côte de Dents,[b] literally "Coast of Teeth", again reflecting the trade in ivory; the Côte de Quaqua, after the people whom the Dutch named the Quaqua (alternatively Kwa Kwa); the Coast of the Five and Six Stripes, after a type of cotton fabric also traded there; and the Côte du Vent,[c] the Windward Coast, after perennial local off-shore weather conditions. One can find the name Cote de(s) Dents regularly used in older works. It was used in Duckett's Dictionnaire (Duckett 1853) and by Nicolas Villault de Bellefond, for example, although Antoine François Prévost used Côte d'Ivoire. 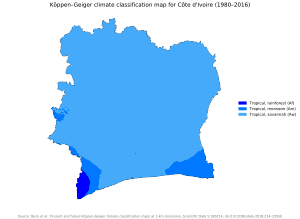 In the 19th century, usage switched to Côte d'Ivoire. The coastline of the modern state is not quite coterminous with what the 15th- and 16th-century merchants knew as the "Teeth" or "Ivory" coast, which was considered to stretch from Cape Palmas to Cape Three Points and which is thus now divided between the modern states of Ghana and Ivory Coast (with a minute portion of Liberia). It retained the name through French rule and independence in 1960. The name had long since been translated literally into other languages,[d] which the post-independence government considered increasingly troublesome whenever its international dealings extended beyond the Francophone sphere. Therefore, in April 1986, the government declared that Côte d'Ivoire (or, more fully, République de Côte d'Ivoire) would be its formal name for the purposes of diplomatic protocol, and since then officially refuses to recognize or accept any translation from French to another language in its international dealings. The first human presence in Ivory Coast has been difficult to determine because human remains have not been well preserved in the country's humid climate. However, newly found weapon and tool fragments (specifically, polished axes cut through shale and remnants of cooking and fishing) have been interpreted as a possible indication of a large human presence during the Upper Paleolithic period (15,000 to 10,000 BC), or at the minimum, the Neolithic period. The earliest known inhabitants of Ivory Coast have left traces scattered throughout the territory. Historians believe that they were all either displaced or absorbed by the ancestors of the present indigenous inhabitants, who migrated south into the area before the 16th century. Such groups included the Ehotilé (Aboisso), Kotrowou (Fresco), Zéhiri (Grand Lahou), Ega and Diès (Divo). The first recorded history appears[when?] in the chronicles[where?] of North African (Berber) traders, who, from early Roman times, conducted a caravan trade across the Sahara in salt, slaves, gold, and other goods. The southern terminals of the trans-Saharan trade routes were located on the edge of the desert, and from there supplemental trade extended as far south as the edge of the rain forest. The more important terminals—Djenné, Gao, and Timbuctu—grew into major commercial centres around which the great Sudanic empires developed. By controlling the trade routes with their powerful military forces, these empires were able to dominate neighbouring states. The Sudanic empires also became centres of Islamic education. Islam had been introduced in the western Sudan by Muslim Berber traders from North Africa; it spread rapidly after the conversion of many important rulers. From the 11th century, by which time the rulers of the Sudanic empires had embraced Islam, it spread south into the northern areas of contemporary Ivory Coast. The Ghana Empire, the earliest of the Sudanic empires, flourished in the region encompassing present-day southeast Mauritania and southern Mali between the 4th and 13th centuries. At the peak of its power in the 11th century, its realms extended from the Atlantic Ocean to Timbuktu. After the decline of Ghana, the Mali Empire grew into a powerful Muslim state, which reached its apogee in the early part of the 14th century. The territory of the Mali Empire in Ivory Coast was limited to the north-west corner around Odienné. Its slow decline starting at the end of the 14th century followed internal discord and revolts by vassal states, one of which, Songhai, flourished as an empire between the 14th and 16th centuries. Songhai was also weakened by internal discord, which led to factional warfare. This discord spurred most of the migrations southward toward the forest belt. The dense rain forest covering the southern half of the country, created barriers to the large-scale political organizations that had arisen in the north. Inhabitants lived in villages or clusters of villages; their contacts with the outside world were filtered through long-distance traders. Villagers subsisted on agriculture and hunting. Five important states flourished in Ivory Coast during the pre-European early modern period. The Muslim Kong Empire was established by the Joola in the early 18th century in the north-central region inhabited by the Sénoufo, who had fled Islamization under the Mali Empire. Although Kong became a prosperous center of agriculture, trade, and crafts, ethnic diversity and religious discord gradually weakened the kingdom. In 1895 the city of Kong would be sacked and conquered by Samori Ture of the Wassoulou Empire. The Abron kingdom of Gyaaman was established in the 17th century by an Akan group, the Abron, who had fled the developing Ashanti confederation of Asanteman in what is present-day Ghana. From their settlement south of Bondoukou, the Abron gradually extended their hegemony over the Dyula people in Bondoukou, who were recent arrivals from the market city of Begho. Bondoukou developed into a major center of commerce and Islam. The kingdom's Quranic scholars attracted students from all parts of West Africa. In the mid-17th century in east-central Ivory Coast, other Akan groups fleeing the Asante established a Baoulé kingdom at Sakasso and two Agni kingdoms, Indénié and Sanwi. The Baoulé, like the Ashanti, developed a highly centralized political and administrative structure under three successive rulers. It finally split into smaller chiefdoms. Despite the breakup of their kingdom, the Baoulé strongly resisted French subjugation. The descendants of the rulers of the Agni kingdoms tried to retain their separate identity long after Ivory Coast's independence; as late as 1969, the Sanwi attempted to break away from Ivory Coast and form an independent kingdom. The current king of Sanwi is Amon N'Douffou V (since 2005). Compared to neighboring Ghana, Ivory Coast, though practicing slavery and slave raiding, suffered little from the slave trade as such. European slave and merchant ships preferred other areas along the coast. The earliest recorded European voyage to West Africa was made by the Portuguese in 1482. The first West African French settlement, Saint Louis, was founded in the mid-17th century in Senegal, while at about the same time, the Dutch ceded to the French a settlement at Goree Island, off Dakar. A French mission was established in 1637 at Assinie near the border with the Gold Coast (now Ghana). The Europeans suppressed the local practice of slavery at this time, and forbade the trade to their merchants. Assinie's survival was precarious, however; the French were not firmly established in Ivory Coast until the mid-19th century. In 1843–4, French admiral Louis Edouard Bouët-Willaumez signed treaties with the kings of the Grand Bassam and Assinie regions, making their territories a French protectorate. French explorers, missionaries, trading companies, and soldiers gradually extended the area under French control inland from the lagoon region. Pacification was not accomplished until 1915. Activity along the coast stimulated European interest in the interior, especially along the two great rivers, the Senegal and the Niger. Concerted French exploration of West Africa began in the mid-19th century, but moved slowly, based more on individual initiative than on government policy. 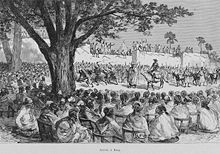 In the 1840s, the French concluded a series of treaties with local West African chiefs that enabled the French to build fortified posts along the Gulf of Guinea to serve as permanent trading centres. The first posts in Ivory Coast included one at Assinie and another at Grand Bassam, which became the colony's first capital. The treaties provided for French sovereignty within the posts, and for trading privileges in exchange for fees or coutumes paid annually to the local chiefs for the use of the land. The arrangement was not entirely satisfactory to the French, because trade was limited and misunderstandings over treaty obligations often arose. Nevertheless, the French government maintained the treaties, hoping to expand trade. France also wanted to maintain a presence in the region to stem the increasing influence of the British along the Gulf of Guinea coast. The French built naval bases to keep out non-French traders and began a systematic pacification of the interior to stop raids on their settlements. They accomplished this only after a long war in the 1890s against Mandinka tribesmen, mostly from Gambia. However, raids by the Baoulé and other eastern tribes continued until 1917. The defeat of France in the Franco-Prussian War in 1871 and the subsequent annexation by Germany of the French province of Alsace-Lorraine caused the French government to abandon its colonial ambitions and withdraw its military garrisons from its West African trading posts, leaving them in the care of resident merchants. The trading post at Grand Bassam in Ivory Coast was left in the care of a shipper from Marseille, Arthur Verdier, who in 1878 was named Resident of the Establishment of Ivory Coast. In 1886, to support its claims of effective occupation, France again assumed direct control of its West African coastal trading posts and embarked on an accelerated program of exploration in the interior. In 1887, Lieutenant Louis Gustave Binger began a two-year journey that traversed parts of Ivory Coast's interior. By the end of the journey, he had concluded four treaties establishing French protectorates in Ivory Coast. Also in 1887, Verdier's agent, Marcel Treich-Laplène, negotiated five additional agreements that extended French influence from the headwaters of the Niger River Basin through Ivory Coast. 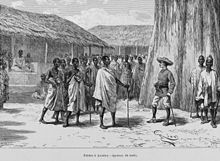 Arrival in Kong of new French West Africa governor Louis-Gustave Binger in 1892. By the end of the 1880s, France had established control over the coastal regions of Ivory Coast, and in 1889 Britain recognized French sovereignty in the area. That same year, France named Treich-Laplène titular governor of the territory. In 1893, Ivory Coast became a French colony, and Captain Binger was appointed governor. Agreements with Liberia in 1892 and with Britain in 1893 determined the eastern and western boundaries of the colony, but the northern boundary was not fixed until 1947 because of efforts by the French government to attach parts of Upper Volta (present-day Burkina Faso) and French Sudan (present-day Mali) to Ivory Coast for economic and administrative reasons. France's main goal was to stimulate the production of exports. Coffee, cocoa, and palm oil crops were soon planted along the coast. Ivory Coast stood out as the only West African country with a sizeable population of settlers; elsewhere in West and Central Africa, the French and British were largely bureaucrats. As a result, French citizens owned one-third of the cocoa, coffee, and banana plantations and adopted the local forced-labor system. Throughout the early years of French rule, French military contingents were sent inland to establish new posts. Some of the native population and former slave-owning class resisted French settlers. 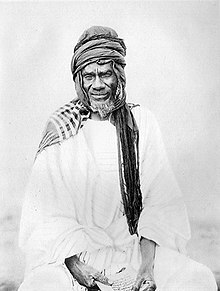 Among those offering greatest resistance was Samori Ture, who in the 1880s and 1890s was conquering his neighbors, re-establishing slavery and founding the Wassoulou Empire, which extended over large parts of present-day Guinea, Mali, Burkina Faso, and Ivory Coast. Samori Ture's large, well-equipped army, which could manufacture and repair its own firearms, attracted some support throughout the region from chiefs who sought to play the two sides off against each other. The French responded to Samori Ture's expansion and conquest with military pressure. French campaigns against Samori Ture, which were met with greater resistance than usual in tribal warfare, intensified in the mid-1890s until he was captured in 1898 and his empire dissolved. France's imposition of a head tax in 1900 to support the colony's public works program provoked unexpected protests. Many Ivoirians saw the tax as a violation of the protectorate treaties because they felt that France was demanding the equivalent of a coutume from the local kings, rather than the reverse. Many, especially in the interior, also considered the tax a humiliating symbol of submission. In 1905, the French officially abolished slavery in most of French West Africa. From 1904 to 1958, Ivory Coast was part of the Federation of French West Africa. It was a colony and an overseas territory under the Third Republic. In World War I, France organized regiments from Ivory Coast to fight in France, and colony resources were rationed from 1917–1919. Some 150,000 men from Ivory Coast died in World War I. Until the period following World War II, governmental affairs in French West Africa were administered from Paris. France's policy in West Africa was reflected mainly in its philosophy of "association", meaning that all Africans in Ivory Coast were officially French "subjects", but without rights to representation in Africa or France. French colonial policy incorporated concepts of assimilation and association. Based on the assumed superiority of French culture, in practice the assimilation policy meant the extension of French language, institutions, laws, and customs to the colonies. The policy of association also affirmed the superiority of the French in the colonies, but it entailed different institutions and systems of laws for the colonizer and the colonized. Under this policy, the Africans in Ivory Coast were allowed to preserve their own customs insofar as they were compatible with French interests, such as the recent abolition of the slave trade. An indigenous elite trained in French administrative practice formed an intermediary group between French and Africans. After 1930, a small number of Westernized Ivoirians were granted the right to apply for French citizenship. Most Ivoirians, however, were classified as French subjects and were governed under the principle of association. As subjects of France, natives outside the above-mentioned civilized elite had no political rights. They were drafted for work in mines, on plantations, as porters, and on public projects as part of their tax responsibility. They were expected to serve in the military and were subject to the indigénat, a separate system of law. In World War II, the Vichy regime remained in control until 1942, when British troops invaded without much resistance. Winston Churchill gave power back to members of General Charles de Gaulle's provisional government. By 1943, the Allies had returned French West Africa to the French. The Brazzaville Conference of 1944, the first Constituent Assembly of the Fourth Republic in 1946, and France's gratitude for African loyalty during World War II, led to far-reaching governmental reforms in 1946. French citizenship was granted to all African "subjects", the right to organize politically was recognized, and various forms of forced labor were abolished. Between the years 1944–1946 many national conferences and constituent assemblies took place between France's Vichy regime and provisional governments in Ivory Coast. Governmental reforms were established by late 1946, which granted French citizenship to all African "subjects" under the colonial control of the French. Until 1958, governors appointed in Paris administered the colony of Ivory Coast, using a system of direct, centralized administration that left little room for Ivoirian participation in policy-making. While British colonial administrations adopted divide-and-rule policies elsewhere, applying ideas of assimilation only to the educated elite, the French were interested in ensuring that the small but influential elite was sufficiently satisfied with the status quo to refrain from anti-French sentiment. Although strongly opposed to the practices of association, educated Ivoirians believed that they would achieve equality with their French peers through assimilation rather than through complete independence from France. After the assimilation doctrine was implemented through the postwar reforms, though, Ivoirian leaders realized that even assimilation implied the superiority of the French over the Ivoirians. Some of them thought that discrimination and political inequality would end only with independence; others thought the problem of the division between the tribal culture and modernity would continue. 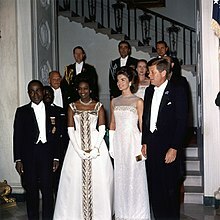 President Félix Houphouët-Boigny and First Lady Marie-Thérèse Houphouët-Boigny in the White House Entrance Hall with President John F. Kennedy and First Lady Jacqueline Kennedy in 1962. Félix Houphouët-Boigny, the son of a Baoulé chief, became Ivory Coast's father of independence. In 1944, he formed the country's first agricultural trade union for African cocoa farmers like himself. Angered that colonial policy favoured French plantation owners, the union members united to recruit migrant workers for their own farms. Houphouët-Boigny soon rose to prominence and within a year was elected to the French Parliament in Paris. A year later, the French abolished forced labour. Houphouët-Boigny established a strong relationship with the French government, expressing a belief that the Ivory Coast would benefit from the relationship, which it did for many years. France appointed him as a minister, the first African to become a minister in a European government. A turning point in relations with France was reached with the 1956 Overseas Reform Act (Loi Cadre), which transferred a number of powers from Paris to elected territorial governments in French West Africa and also removed the remaining voting inequities. 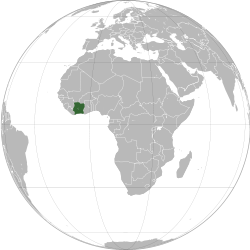 In 1958, Ivory Coast became an autonomous member of the French Community, which had replaced the French Union. At independence (1960), the country was easily French West Africa's most prosperous, contributing over 40% of the region's total exports. When Houphouët-Boigny became the first president, his government gave farmers good prices for their products to further stimulate production, which was further boosted by a significant immigration of workers from surrounding countries. Coffee production increased significantly, catapulting Ivory Coast into third place in world output, behind Brazil and Colombia. By 1979, the country was the world's leading producer of cocoa. It also became Africa's leading exporter of pineapples and palm oil. French technicians contributed to the "Ivoirian miracle". In other African nations, the people drove out the Europeans following independence, but in Ivory Coast, they poured in. The French community grew from only 30,000 prior to independence to 60,000 in 1980, most of them teachers, managers, and advisors. For 20 years, the economy maintained an annual growth rate of nearly 10%—the highest of Africa's non-oil-exporting countries. Houphouët-Boigny's one-party rule was not amenable to political competition. Laurent Gbagbo, who would become the president of Ivory Coast in 2000, had to flee the country in the 1980s, after he incurred the ire of Houphouët-Boigny by founding the Front Populaire Ivoirien. Houphouët-Boigny banked on his broad appeal to the population, who continued to elect him. He was criticized for his emphasis on developing large-scale projects. Many felt the millions of dollars spent transforming his home village, Yamoussoukro, into the new political capital were wasted; others supported his vision to develop a centre for peace, education, and religion in the heart of the country. In the early 1980s, the world recession and a local drought sent shock waves through the Ivoirian economy. Due to the overcutting of timber and collapsing sugar prices, the country's external debt increased three-fold. 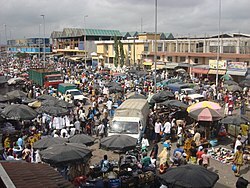 Crime rose dramatically in Abidjan as an influx of villagers exacerbated unemployment caused by the recession. In 1990, hundreds of civil servants went on strike, joined by students protesting institutional corruption. The unrest forced the government to support multiparty democracy. Houphouët-Boigny became increasingly feeble, and died in 1993. He favoured Henri Konan Bédié as his successor. In October 1995, Bédié overwhelmingly won re-election against a fragmented and disorganised opposition. He tightened his hold over political life, jailing several hundred opposition supporters. In contrast, the economic outlook improved, at least superficially, with decreasing inflation and an attempt to remove foreign debt. Unlike Houphouët-Boigny, who was very careful to avoid any ethnic conflict and left access to administrative positions open to immigrants from neighbouring countries, Bedié emphasized the concept of Ivoirité to exclude his rival Alassane Ouattara, who had two northern Ivorian parents, from running for future presidential election. As people originating from foreign countries are a large part of the Ivoirian population, this policy excluded many people from Ivoirian nationality, and the relationship between various ethnic groups became strained, which resulted in two civil wars in the following decades. Similarly, Bedié excluded many potential opponents from the army. In late 1999, a group of dissatisfied officers staged a military coup, putting General Robert Guéï in power. Bedié fled into exile in France. The new leadership reduced crime and corruption, and the generals pressed for austerity and campaigned in the streets for a less wasteful society. A presidential election was held in October 2000 in which Laurent Gbagbo vied with Guéï, but it was not peaceful. The lead-up to the election was marked by military and civil unrest. Following a public uprising that resulted in around 180 deaths, Guéï was swiftly replaced by Gbagbo. Alassane Ouattara was disqualified by the country's Supreme Court, due to his alleged Burkinabé nationality. The existing and later reformed constitution [under Guéï] did not allow noncitizens to run for the presidency. This sparked violent protests in which his supporters, mainly from the country's north, battled riot police in the capital, Yamoussoukro. In the early hours of 19 September 2002, while the President was in Italy, an armed uprising occurred. Troops who were to be demobilised mutinied, launching attacks in several cities. The battle for the main gendarmerie barracks in Abidjan lasted until mid-morning, but by lunchtime, the government forces had secured Abidjan. They had lost control of the north of the country, and rebel forces made their stronghold in the northern city of Bouaké. The rebels threatened to move on Abidjan again, and France deployed troops from its base in the country to stop their advance. The French said they were protecting their own citizens from danger, but their deployment also helped government forces. That the French were helping either side was not established as a fact; but each side accused the French of supporting the opposite side. Whether French actions improved or worsened the situation in the long term is disputed. What exactly happened that night is also disputed. The government claimed that former president Robert Guéï led a coup attempt, and state TV showed pictures of his dead body in the street; counter-claims stated that he and 15 others had been murdered at his home, and his body had been moved to the streets to incriminate him. 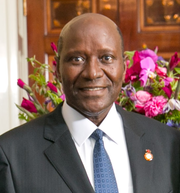 Alassane Ouattara took refuge in the German embassy; his home had been burned down. President Gbagbo cut short his trip to Italy and on his return stated, in a television address, that some of the rebels were hiding in the shanty towns where foreign migrant workers lived. Gendarmes and vigilantes bulldozed and burned homes by the thousands, attacking residents. An early ceasefire with the rebels, which had the backing of much of the northern populace, proved short-lived, and fighting over the prime cocoa-growing areas resumed. France sent in troops to maintain the cease-fire boundaries, and militias, including warlords and fighters from Liberia and Sierra Leone, took advantage of the crisis to seize parts of the west. In January 2003, Gbagbo and rebel leaders signed accords creating a "government of national unity". Curfews were lifted, and French troops patrolled the western border of the country. The unity government was unstable, and central problems remained, with neither side achieving its goals. In March 2004, 120 people were killed at an opposition rally, and subsequent mob violence led to the evacuation of foreign nationals. A later report concluded the killings were planned. Though UN peacekeepers were deployed to maintain a "Zone of Confidence", relations between Gbagbo and the opposition continued to deteriorate. Early in November 2004, after the peace agreement had effectively collapsed because the rebels refused to disarm, Gbagbo ordered airstrikes against the rebels. During one of these airstrikes in Bouaké, on 6 November 2004, French soldiers were hit, and nine were killed; the Ivorian government said it was a mistake, but the French claimed it was deliberate. They responded by destroying most Ivoirian military aircraft (two Su-25 planes and five helicopters), and violent retaliatory riots against the French broke out in Abidjan. Gbagbo's original term as president expired on 30 October 2005, but due to the lack of disarmament, an election was deemed impossible, so his term in office was extended for a maximum of one year, according to a plan worked out by the African Union and endorsed by the United Nations Security Council. With the late-October deadline approaching in 2006, the election was regarded as very unlikely to be held by that point, and the opposition and the rebels rejected the possibility of another term extension for Gbagbo. The UN Security Council endorsed another one-year extension of Gbagbo's term on 1 November 2006; however, the resolution provided for strengthening of Prime Minister Charles Konan Banny's powers. Gbagbo said the next day that elements of the resolution deemed to be constitutional violations would not be applied. A peace accord between the government and the rebels, or New Forces, was signed on 4 March 2007, and subsequently Guillaume Soro, leader of the New Forces, became prime minister. These events were seen by some observers as substantially strengthening Gbagbo's position. According to UNICEF, at the end of the civil war, water and sanitation infrastructure had been greatly damaged. Communities across the country required repairs to their water supply. The presidential elections that should have been organized in 2005 were postponed until November 2010. The preliminary results announced independently by the president of the Electoral Commission from the headquarters of Ouattara due to concern about fraud in that commission. [clarification needed] They showed a loss for Gbagbo in favour of former prime minister Alassane Ouattara. The ruling FPI contested the results before the Constitutional Council, charging massive fraud in the northern departments controlled by the rebels of the New Forces. These charges were contradicted by United Nations observers (unlike African Union observers). The report of the results led to severe tension and violent incidents. The Constitutional Council, which consisted of Gbagbo supporters, declared the results of seven northern departments unlawful and that Gbagbo had won the elections with 51% of the vote – instead of Ouattara winning with 54%, as reported by the Electoral Commission. After the inauguration of Gbagbo, Ouattara—who was recognized as the winner by most countries and the United Nations—organized an alternative inauguration. These events raised fears of a resurgence of the civil war; thousands of refugees fled the country. The African Union sent Thabo Mbeki, former President of South Africa, to mediate the conflict. 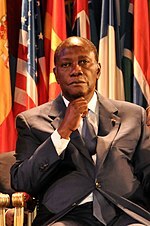 The United Nations Security Council adopted a resolution recognising Alassane Ouattara as winner of the elections, based on the position of the Economic Community of West African States, which suspended Ivory Coast from all its decision-making bodies while the African Union also suspended the country's membership. In 2010, a colonel of the Ivory Coast armed forces, Nguessan Yao, was arrested in New York in a year-long U.S. Immigration and Customs Enforcement operation charged with procuring and illegal export of weapons and munitions: 4,000 9 mm handguns, 200,000 rounds of ammunition, and 50,000 tear-gas grenades, in violation of a UN embargo. Several other Ivory Coast officers were released because they had diplomatic passports. His accomplice, Michael Barry Shor, an international trader, was located in Virginia. The 2010 presidential election led to the 2010–2011 Ivorian crisis and the Second Ivorian Civil War. International organizations reported numerous human-rights violations by both sides. In the city of Duékoué, hundreds of people were killed. In nearby Bloléquin, dozens were killed. UN and French forces took military action against Gbagbo. Gbagbo was taken into custody after a raid into his residence on 11 April 2011. The country was severely damaged by the war, and observers say it will be a challenge for Ouattara to rebuild the economy and reunite Ivorians. Gbagbo was taken to the International Criminal Court in The Hague in January 2016. He was declared acquitted by the court but implausibly given a conditional release in January 2019. Belgium has been designated as a host country. Ivory Coast is a country of western sub-Saharan Africa. It borders Liberia and Guinea in the west, Mali and Burkina Faso in the north, Ghana in the east, and the Gulf of Guinea (Atlantic Ocean) in the south. The country lies between latitudes 4° and 11°N, and longitudes 2° and 9°W. Around 64.8% of the land is agricultural land; arable land amounted to 9.1%, permanent pasture 41.5%, and permanent crops 14.2%. Water pollution is amongst one of the biggest issues that the country is currently facing. Since 2011, Ivory Coast has been administratively organised into 12 districts plus two district-level autonomous cities. The districts are divided into 31 regions; the regions are divided into 108 departments; and the departments are divided into 510 sub-prefectures. In some instances, multiple villages are organised into communes. The autonomous districts are not divided into regions, but they do contain departments, sub-prefectures, and communes. Since 2011, governors for the 12 non-autonomous districts have not been appointed, and as a result these districts have not yet begun to function as governmental entities. The government is divided into three branches: the executive power, the legislative power, and the judicial power. In the legislative branch, Guillaume Soro directs the 2016 National Assembly and its 225 members, elected for five-year terms. Since 1983, Ivory Coast's capital has been Yamoussoukro, while Abidjan was the administrative center. Most countries maintain their embassies in Abidjan. The Ivorian population has suffered because of the ongoing civil war. International human-rights organizations have noted problems with the treatment of captive non-combatants by both sides and the re-emergence of child slavery in cocoa production. Although most of the fighting ended by late 2004, the country remained split in two, with the north controlled by the New Forces. A new presidential election was expected to be held in October 2005, and the rival parties agreed in March 2007 to proceed with this, but it continued to be postponed until November 2010 due to delays in its preparation. Elections were finally held in 2010. The first round of elections was held peacefully, and widely hailed as free and fair. Runoffs were held 28 November 2010, after being delayed one week from the original date of 21 November. Laurent Gbagbo as president ran against former Prime Minister Alassane Ouattara. On 2 December, the Electoral Commission declared that Ouattara had won the election by a margin of 54% to 46%. In response, the Gbagbo-aligned Constitutional Council rejected the declaration, and the government announced that country's borders had been sealed. An Ivorian military spokesman said, "The air, land, and sea border of the country are closed to all movement of people and goods." Former President Laurent Gbagbo was extradited to the International Criminal Court (ICC), becoming the first head of state to be taken into the court's custody. In Africa, Ivorian diplomacy favors step-by-step economic and political cooperation. In 1959, Ivory Coast formed the Council of the Entente with Dahomey (Benin), Upper Volta (Burkina Faso), Niger and Togo; in 1965, the African and Malagasy Common Organization (OCAM); in 1972, the Economic Community of West Africa (CEAO). The latter organisation changed to the Economic Community of West African States (ECOWAS) in 1975. A founding member of the Organization of African Unity (OAU) in 1963 and then of the African Union in 2000, Ivory Coast defends respect for state sovereignty and peaceful cooperation between African countries. Worldwide, Ivorian diplomacy is committed to fair economic and trade relations, including the fair trade of agricultural products and the promotion of peaceful relations with all countries. Ivory Coast thus maintains diplomatic relations with international organizations and countries all around the world. In particular, it has signed United Nations treaties such as the Convention relating to the Status of Refugees, the 1967 Protocol, and the 1969 Convention Governing Specific Aspects of Refugee Problems in Africa. Ivory Coast is a member of the Organisation of Islamic Cooperation, African Union, La Francophonie, Latin Union, Economic Community of West African States, and South Atlantic Peace and Cooperation Zone. Ivory Coast has partnered with nations of the Sub-Saharan region to strengthen water and sanitation infrastructure. This has been done mainly with the help of organizations such as UNICEF and Nestle. In 2015, the United Nations engineered the Sustainable Development Goals (replacing the Millennium Development Goals). They focus on health, education, poverty, hunger, climate change, water sanitation, and hygiene. A major focus was clean water and salinisation. Experts working on this field have designed the WASH concept. WASH focuses on safe drinkable water, hygiene, and proper sanitation. The group has had a major impact on the sub-Saharan region of Africa, particularly the Ivory Coast. By 2030, they plan to have universal and equal access to safe and affordable drinking water. As of 2012[update], major equipment items reported by the Ivory Coast Army included 10 T-55 tanks (marked as potentially unserviceable), five AMX-13 light tanks, 34 reconnaissance vehicles, 10 BMP-½ armoured infantry fighting vehicles, 41 wheeled APCs, and 36+ artillery pieces. In 2012, the Ivory Coast Airforce consisted of one Mil Mi-24 attack helicopter and three SA330L Puma transports (marked as potentially unserviceable). Ivory Coast has, for the region, a relatively high income per capita (US$1,662 in 2017) and plays a key role in transit trade for neighboring, landlocked countries. The country is the largest economy in the West African Economic and Monetary Union, constituting 40% of the monetary union's total GDP. The country is the world's largest exporter of cocoa beans, and the fourth-largest exporter of goods, in general, in sub-Saharan Africa (following South Africa, Nigeria, and Angola). In 2009, cocoa-bean farmers earned $2.53 billion for cocoa exports and were projected to produce 630,000 metric tons in 2013. According to the Hershey Company, the price of cocoa beans is expected to rise dramatically in upcoming years. The Ivory Coast also has 100,000 rubber farmers who earned a total of $105 million in 2012. Close ties to France since independence in 1960, diversification of agricultural exports, and encouragement of foreign investment have been factors in the economic growth of Ivory Coast. In recent years, Ivory Coast has been subject to greater competition and falling prices in the global marketplace for its primary agricultural crops: coffee and cocoa. That, compounded with high internal corruption, makes life difficult for the grower, those exporting into foreign markets, and the labor force, inasmuch as instances of indentured labor have been reported in the country's cocoa and coffee production in every edition of the U.S. Department of Labor's List of Goods Produced by Child Labor or Forced Labor since 2009. The Ivory Coast's economy has grown faster than that of most other African countries since independence. One possible reason for this might be taxes on export agriculture. Ivory Coast, Nigeria, and Kenya were exceptions as their rulers were themselves large cash-crop producers, and the newly independent countries desisted from imposing penal rates of taxation on export agriculture, with the result that their economies were doing well. "According to the 2015 edition of the Cocoa Barometer, a biennial report examining the economics of cocoa that’s published by a consortium of nonprofits, the average farmer in Ghana in the 2013–14 growing season made just 84¢ per day, and farmers in Ivory Coast a mere 50¢. That puts them well below the World Bank’s new $1.90 per day standard for extreme poverty, even if you factor in the 13% rise in the price of cocoa last year. Abidjan is the Ivory Coast's largest city and its economic capital. Ivory Coast's first national census in 1975 counted 6.7 million inhabitants. Until 1998 the country's population increased to 15,366,672, 20,617,068 in 2009, and 23,919,000 in July 2014. According to 2012 government survey, the fertility rate was 5.0 children born per woman, with 3.7 in urban areas and 6.3 in rural areas. French, the official language, is taught in schools and serves as a lingua franca in the country. An estimated 70 languages are spoken in Ivory Coast. One of the most common is Dyula, which acts as a trade language, as well as a language commonly spoken by the Muslim population. Around 7.5 million people of Ivory Coast made up the work force in 2009. The work force took a hit, especially in the private sector, during the early 2000s due to the numerous economic crises since 1999. Furthermore, these crises caused companies to close and move locations, especially in Ivory Coast's tourism industry, transit and banking companies. Job markets decreasing posed as a huge issue in Ivory Coast society as unemployment rates grew. Unemployment rates raised to 9.4% in 2012. Solutions proposed to decrease unemployment included diversifying jobs in small trade. This division of work encouraged farmers and the agricultural sector. Self-employment policy, established by the Ivorian government, allowed for very strong growth in the field with an increase of 142% in seven years from 1995. Despite efforts like this to decrease unemployment, it still remains as a social problem. Ethnic groups include Akan (42.1%), Voltaiques or Gur (17.6%), Northern Mandés (16.5%), Krous (11%), Southern Mandés (10%), and others (2.8%, including 30,000 Lebanese and 45,000 French; 2004). About 77% of the population is considered Ivorian. Since Ivory Coast has established itself as one of the most successful West African nations, about 20% of the population (about 3.4 million) consists of workers from neighbouring Liberia, Burkina Faso, and Guinea. About 4% of the population is of non-African ancestry. Many are French, Lebanese, Vietnamese and Spanish citizens, as well as Protestant missionaries from the United States and Canada. 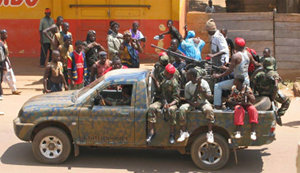 In November 2004, around 10,000 French and other foreign nationals evacuated Ivory Coast due to attacks from pro-government youth militias. Aside from French nationals, native-born descendants of French settlers who arrived during the country's colonial period are present. Basilica of our Lady of Peace in Yamoussoukro; one of the largest Christian places of worship in the world. The Ivory Coast is a religiously diverse country, in which adherents of Islam (mostly Sunni) represented 42.9% of the total population in 2014, while followers of Christianity (mostly Catholic and Evangelical) represented 33.9% of the population. In addition 19.1% of Ivorians claimed to be irreligious, and 3.6% reported following traditional African religions. In 2009, according to U.S. Department of State estimates, Christians and Muslims each made up 35 to 40% of the population, while an estimated 25% of the population practised traditional (animist) religions. 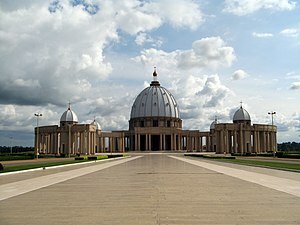 Ivory Coast's capital, Yamoussoukro, is home to the largest church building[g] in the world, the Basilica of Our Lady of Peace of Yamoussoukro. Judaism is not a major religion in the Ivory Coast, but Jews can still be found scattered throughout the country. The Jewish people had a larger presence in the late 20th century before a mass Jewish immigration in which Jews from the Ivory Coast and all over the world left their native countries for Israel. Despite this, the Jewish population is beginning to re-emerge in the Ivory Coast. Life expectancy at birth was 41 for males in 2004; for females it was 47. Infant mortality was 118 of 1000 live births. Twelve physicians are available per 100,000 people. About a quarter of the population lives below the international poverty line of US$1.25 a day. About 36% of women have undergone female genital mutilation. According to 2010 estimates, Ivory Coast has the 27th-highest maternal mortality rate in the world. The HIV/AIDS rate was 19th-highest in the world, estimated in 2012 at 3.20% among adults aged 15–49 years. A large part of the adult population, in particular women, is illiterate. Many children between 6 and 10 years are not enrolled in school. The majority of students in secondary education are male. At the end of secondary education, students can sit the baccalauréat examination. The country has a number of universities, such as the Université de Cocody in Abidjan and the Université de Bouaké in Bouaké. In 2012, there were 57,541 students enrolled at post-secondary diploma level, 23,008 students studying for a bachelor's or master's degree and 269 PhD students. Enrolment in tertiary education suffered during the political crisis, dropping from 9.03% to 4.46% of the 18-25-year cohort between 2009 and 2012. According to the Ministry of Higher Education and Scientific Research, Ivory Coast devotes about 0.13% of GDP to GERD. Apart from low investment, other challenges include inadequate scientific equipment, the fragmentation of research organizations and a failure to exploit and protect research results. The share of the National Development Plan for 2012–2015 that is devoted to scientific research remains modest. Within the section on greater wealth creation and social equity (63.8% of the total budget for the Plan), just 1.2% is allocated to scientific research. Twenty-four national research programmes group public and private research and training institutions around a common research theme. These programmes correspond to eight priority sectors for 2012–2015, namely: health, raw materials, agriculture, culture, environment, governance, mining and energy; and technology. Each of the ethnic groups in Ivory Coast has its own music genres, most showing strong vocal polyphony. Talking drums are also common, especially among the Appolo, and polyrhythms, another African characteristic, are found throughout Ivory Coast and are especially common in the southwest. Popular music genres from Ivory Coast include zoblazo, zouglou, and Coupé-Décalé. A few Ivorian artists who have known international success are Magic Système, Alpha Blondy, Meiway, Dobet Gnahoré, Tiken Jah Fakoly, and Christina Goh, of Ivorian descent. The country has been the host for several major African sporting events, with the most recent being the 2013 African Basketball Championship. In the past, the country hosted the 1984 Africa Cup of Nations, in which its football team finished fifth, and the 1985 African Basketball Championship, where its basketball team won the gold medal. Ivory Coast won an Olympic silver medal for men's 400-metre in the 1984 games, where it competed as "Côte d'Ivoire". The most popular sport in Ivory Coast is association football. The national football team has played in the World Cup three times, in Germany 2006, in South Africa 2010, and Brazil in 2014. The woman's football team played in the 2015 Women's World Cup in Canada. Ivory Coast notable footballers are Didier Drogba, Yaya Touré and Kolo Touré, Eric Bailly, Gervinho, and Wilfried Zaha. Rugby union is also popular, and the national rugby union team qualified to play at the Rugby World Cup in South Africa in 1995. Ivory Coast also won two Africa Cups one 1992 and the other 2015. In 2019, a team of British climbers visited the Ivory Coast and established the country's first climbing routes in Man . Yassa is a popular dish throughout West Africa prepared with chicken or fish. Chicken yassa is pictured. The traditional cuisine of Ivory Coast is very similar to that of neighboring countries in West Africa in its reliance on grains and tubers. Cassava and plantains are significant parts of Ivorian cuisine. A type of corn paste called aitiu is used to prepare corn balls, and peanuts are widely used in many dishes. Attiéké is a popular side dish in Ivory Coast made with grated cassava, a vegetable-based couscous. A common street food is alloco, ripe banana fried in palm oil, spiced with steamed onions and chili and eaten alone, with grilled fish or boiled eggs. Chicken is commonly consumed and has a unique flavor due to its lean, low-fat mass in this region. Seafood includes tuna, sardines, shrimp, and bonito, which is similar to tuna. Mafé is a common dish consisting of meat in a peanut sauce. Slow-simmered stews with various ingredients are another common food staple in Ivory Coast. Kedjenou is a dish consisting of chicken and vegetables slow-cooked in a sealed pot with little or no added liquid, which concentrates the flavors of the chicken and vegetables and tenderizes the chicken. It is usually cooked in a pottery jar called a canary, over a slow fire, or cooked in an oven. Bangui is a local palm wine. Ivorians have a particular kind of small, open-air restaurant called a maquis, which is unique to the region. A maquis normally features braised chicken and fish covered in onions and tomatoes, served with attiéké or kedjenou. ^ The latter being pronounced /ˌkoʊt diːˈvwɑːr/ KOHT dee-VWAR in English and [kot divwaʁ] ( listen) in French. ^ Joseph Vaissète, in his 1755 Géographie historique, ecclésiastique et civile, lists the name as La Côte des Dents ("The Coast of the Teeth"), but notes that Côte de Dents is the more correct form. ^ Côte du Vent sometimes denoted the combined "Ivory" and "Grain" coasts, or sometimes just the "Grain" coast. ^ Literal translations include Elfenbeinküste (German), Costa d'Avorio (Italian), Norsunluurannikko (Finnish), Бе́рег Слоно́вой Ко́сти (Russian), and Ivory Coast. ^ Many governments use "Côte d'Ivoire" for diplomatic reasons, as do their outlets, such as the Chinese CCTV News. Other organizations that use "Côte d'Ivoire" include the Central Intelligence Agency in its World Factbook and the international sport organizations FIFA and the IOC (referring to their national football and Olympic teams in international games and in official broadcasts), news magazine The Economist, the Encyclopædia Britannica and the National Geographic Society. ^ The BBC usually uses "Ivory Coast" both in news reports and on its page about the country. The Guardian newspaper's style guide says: "Ivory Coast, not 'The Ivory Coast' or 'Côte d'Ivoire'; its nationals are Ivorians." ABC News, FOX News, The Times, The New York Times, the South African Broadcasting Corporation, and the Canadian Broadcasting Corporation all use "Ivory Coast" either exclusively or predominantly. ^ It is actually a basilica, but is listed in the Guinness World Records as the largest "church" in the world. This article incorporates public domain material from the Library of Congress Country Studies website http://lcweb2.loc.gov/frd/cs/citoc.html#ci0079. ^ a b c "Côte d'Ivoire". The World Factbook. CIA Directorate of Intelligence. 24 July 2008. Archived from the original on 5 February 2010. Retrieved 8 August 2008. ^ "Côte d'Ivoire". The World Factbook. CIA Directorate of Intelligence. Archived from the original on 5 February 2010. Retrieved 18 February 2017. ^ a b c d "Côte d'Ivoire". International Monetary Fund. ^ "Gini Index". World Bank. Archived from the original on 9 February 2015. Retrieved 2 March 2011. ^ "Cote d'Ivoire definition". Dictionary.com. Archived from the original on 23 July 2015. Retrieved 23 May 2014. ^ "Loi n° 2000-513 du 1er août 2000 portant Constitution de la République de Côte d'Ivoire" (PDF). Journal Officiel de la République de Côte d'Ivoire (in French). 42 (30): 529–538. 3 August 2000. Archived from the original (PDF) on 25 March 2009. Retrieved 7 August 2008. ^ "Penn World Table". Archived from the original on 22 March 2019. ^ a b c d e Thornton 1996, p. 53–56. ^ a b Lipski 2005, p. 39. ^ a b c d Duckett 1853, p. 594. ^ a b Homans 1858, p. 14. ^ Lipsky 2005, p. 39. ^ a b Plée 1868, p. 146. ^ a b c Vaissète 1755, p. 185–186. ^ a b Blanchard 1818, p. 57. ^ a b c d e Chisholm 1911, p. 100. ^ a b c Walckenaer 1827, p. 35. ^ "The Ivory Coast". World Digital Library. Archived from the original on 4 December 2013. Retrieved 16 February 2013. ^ a b David 2000, p. 7. ^ Auzias & Labourdette 2008, p. 9. ^ Lea & Rowe 2001, p. 127. ^ Jessup 1998, p. 351. ^ "Cote d'Ivoire". CIA.gov. Central Intelligence Agency. Archived from the original on 5 February 2010. Retrieved 20 July 2017. ^ "CAF Member Associations". CAF Online. CAF-Confederation of African Football. Archived from the original on 25 July 2017. Retrieved 20 July 2017. ^ "Côte d'Ivoire". International Olympic Committee. Archived from the original on 18 July 2017. Retrieved 20 July 2017. ^ "Research Tools". The Economist. Archived from the original on 1 April 2010. Retrieved 20 June 2010. ^ "Cote d'Ivoire –". Britannica Online Encyclopedia. Britannica.com. Archived from the original on 18 June 2010. Retrieved 20 June 2010. ^ "Places Directory". nationalgeographic.com. 25 June 2008. Archived from the original on 26 March 2011. Retrieved 20 June 2010. ^ "Country profile: Ivory Coast". BBC News. 24 February 2010. Archived from the original on 15 April 2010. Retrieved 30 April 2010. ^ "Guardian Style Guide: I". The Guardian. London. 19 December 2008. Archived from the original on 9 November 2013. Retrieved 30 April 2010. ^ Guédé, François Yiodé (1995). "Contribution à l'étude du paléolithique de la Côte d'Ivoire : État des connaissances" (Submitted manuscript). Journal des Africanistes. 65 (2): 79–91. doi:10.3406/jafr.1995.2432. Archived from the original on 3 June 2018. Retrieved 18 September 2018. ^ a b "Ivory Coast – Arrival of the Europeans". Library of Congress Country Studies. Library of Congress. November 1988. Archived from the original on 14 January 2009. Retrieved 11 April 2009. ^ "Library of Congress Country Studies". Library of Congress. November 1988. Archived from the original on 14 January 2009. Retrieved 11 April 2009. ^ "Slave Emancipation and the Expansion of Islam, 1905–1914 Archived 2 May 2013 at the Wayback Machine". p. 11. ^ "Ivory Coast – FRENCH RULE UNTIL WORLD WAR II: Evolution of Colonial Policy". Library of Congress Country Studies. Library of Congress. November 1988. Archived from the original on 14 January 2009. Retrieved 11 April 2009. ^ "Ivory Coast – Colonial Administration". Library of Congress Country Studies. Library of Congress. November 1988. Archived from the original on 14 January 2009. Retrieved 11 April 2009. ^ "Ivory Coast – Repression and Conquest". Library of Congress Country Studies. Library of Congress. November 1988. Archived from the original on 14 January 2009. Retrieved 11 April 2009. ^ McGovern, Mike (2011) Making War in Côte d'Ivoire, The University of Chicago Press. ISBN 0226514609. p. 16. ^ Anthony Appiah; Henry Louis Gates, eds. (2010). Encyclopedia of Africa. 1. Oxford University Press. p. 330. ISBN 978-0195337709. Archived from the original on 23 March 2017. Retrieved 27 February 2018 – via Google Books. ^ "Ivory Coast – Heart of Darkness". Kepi.cncplusplus.com. Archived from the original on 10 May 2011. Retrieved 20 June 2010. ^ Holguin, Jaime (15 November 2004) "France's 'Little Iraq'". Archived from the original on 8 October 2013. Retrieved 26 October 2009. CS1 maint: BOT: original-url status unknown (link). CBS News. ^ "UN endorses plan to leave president in office beyond mandate" Archived 15 May 2011 at the Wayback Machine, IRIN, 14 October 2005. ^ Bavier, Joe (18 August 2006) "Ivory Coast Opposition, Rebels Say No to Term Extension for President", VOA News. ^ "Partial rejection of UN peace plan" Archived 15 May 2011 at the Wayback Machine, IRIN, 2 November 2006. ^ "New Ivory Coast govt 'a boost for Gbagbo'", AFP via int.iol.co.za, 12 April 2007. ^ "Water And Sanitation". unicef.org. Archived from the original on 14 May 2016. Retrieved 19 May 2016. ^ a b c "Thousands flee Ivory Coast for Liberia amid poll crisis". BBC News. 26 December 2010. Archived from the original on 26 December 2010. Retrieved 26 December 2010. ^ "Final Communique on the Extraordinary Session of the Authority of Heads of State and Government on Cote D’Ivoire" Archived 3 May 2011 at the Wayback Machine, Economic Community of West African States (ECOWAS), 7 December 2010. ^ "Communique of the 252nd Meeting of the Peace and Security Council" Archived 6 February 2011 at the Wayback Machine, African Union, 9 December 2010. ^ "ICE deports Ivory Coast army colonel convicted of arms trafficking". Immigration and Customs Enforcement. 30 November 2012. Archived from the original on 27 February 2018. Retrieved 27 February 2018. ^ "FBI nabbed colonel on official business" Archived 25 August 2013 at the Wayback Machine, UPI, 21 September 2010. ^ DiCampo, Peter (27 April 2011). "An Uncertain Future". Ivory Coast: Elections Turn to War. Pulitzer Center. Archived from the original on 9 July 2011. Retrieved 8 August 2011. ^ Lynch, Colum; Branigin, William (11 April 2011). "Ivory Coast strongman arrested after French forces intervene". Washington Post. Archived from the original on 13 April 2011. Retrieved 12 April 2011. ^ Griffiths, Thalia (11 April 2011). "The war is over — but Ouattara's struggle has barely begun". The Guardian. London. Archived from the original on 11 March 2017. Retrieved 11 December 2016. ^ "ICC orders conditional release of ex-Ivory Coast leader Gbagbo". France 24. 1 February 2019. Archived from the original on 6 March 2019. Retrieved 6 March 2019. ^ "Former Ivory Coast President Laurent Gbagbo freed by International Criminal Court, CNN". Archived from the original on 15 January 2019. Retrieved 15 January 2019. 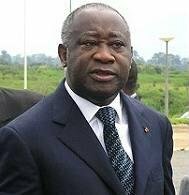 ^ "Ivory Coast's ex-president Laurent Gbagbo released to Belgium". www.aljazeera.com. Archived from the original on 4 March 2019. Retrieved 6 March 2019. ^ "CIA World Factbook Ivory Coast". cia.gov. Archived from the original on 5 February 2010. Retrieved 20 May 2016. 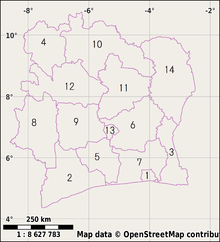 ^ "Districts of Côte d'Ivoire". Statoids. Institut National de la Statistique, Côte d'Ivoire. 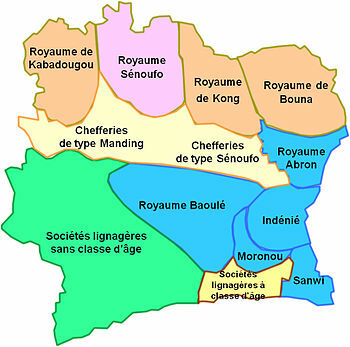 ^ While Yamoussoukro is the seat of Bélier region, the city itself is not part of the region. ^ "Home". Slave Free Chocolate. Archived from the original on 15 July 2017. Retrieved 6 July 2017. ^ Agnero, Eric (10 November 2010). "Ivory Coast postpones presidential runoff vote". CNN. Archived from the original on 8 November 2012. Retrieved 11 November 2010. ^ "Ivory Coast election: Army says it has sealed borders". BBC. 3 December 2010. Archived from the original on 3 December 2010. Retrieved 3 November 2010. ^ "Ivory Coast’s former president Laurent Gbagbo oversaw ‘unspeakable crimes’, says ICC Archived 14 October 2017 at the Wayback Machine". The Daily Telegraph. 28 January 2016. ^ "Water And Sanitation". unicef.org. Archived from the original on 14 May 2016. Retrieved 20 May 2016. ^ "Sustainable Development Goals". sustainabledevelopment.un.org. Archived from the original on 6 May 2016. Retrieved 20 May 2016. ^ IISS The Military Balance 2012, 429. ^ IISS The Military Balance 2012, 430. ^ "Côte d'Ivoire: Financial Sector Profile". MFW4A.org. Archived from the original on 22 October 2010. Retrieved 6 December 2010. ^ "Ivory Coast Makes 1st Cocoa Export Since January". Associated Press via NPR. 9 May 2011. Archived from the original on 3 December 2013. Retrieved 21 January 2014. ^ Monnier, Olivier (27 March 2013). "Ivory Coast San Pedro Port Sees Cocoa Exports Stagnating". Bloomberg. Archived from the original on 2 December 2013. Retrieved 21 January 2014. ^ Tuttle, Brad (23 September 2013), "Time to Get Ready for a Smaller Hershey Bar?" Archived 28 September 2013 at the Wayback Machine Business.time.com. Retrieved on 20 April 2014. ^ "Ivory Coast reaps more rubber as farmers shift from cocoa". Reuters. 13 February 2013. Archived from the original on 2 December 2013. Retrieved 21 January 2014. ^ "Cote d'Ivoire | Office of the United States Trade Representative". Ustr.gov. 29 March 2009. Archived from the original on 3 December 2013. Retrieved 21 January 2014. ^ Baten, Jörg (2016). A History of the Global Economy. From 1500 to the Present. Cambridge University Press. p. 335. ISBN 9781107507180. ^ Ivory Coast – Population Archived 23 June 2011 at the Wayback Machine, U.S. Library of Congress. ^ "Republic of Côte d'Ivoire National Statistical Institute". ins.ci. 1 October 2014. Archived from the original on 9 May 2013. Retrieved 1 October 2014. ^ "Ivory Coast Unemployment Rate | 1998–2017 | Data | Chart | Calendar". www.tradingeconomics.com. Archived from the original on 18 February 2017. Retrieved 17 February 2017. ^ "Ivory Coast – The Economy". Countrystudies.us. Archived from the original on 11 May 2011. Retrieved 20 June 2010. ^ "Ivory Coast – The Levantine Community". Countrystudies.us. Archived from the original on 29 June 2011. Retrieved 20 June 2010. ^ "Rwanda Syndrome on the Ivory Coast Archived 4 September 2009 at the Wayback Machine"
^ Recensement Général de la Population et de l’Habitat 2017 (PDF). Cote d'Ivoire Census. p. 36. Archived (PDF) from the original on 17 May 2017. Retrieved 22 October 2018. ^ "Cote d'Ivoire". The World Factbook — Central Intelligence Agency. United States Government. Archived from the original on 5 February 2010. Retrieved 6 May 2017. ^ Cote d'Ivoire Archived 13 January 2012 at the Wayback Machine. State.gov. Retrieved on 17 August 2012. ^ a b c "WHO Country Offices in the WHO African Region". World Health Organization. Archived from the original on 17 June 2010. Retrieved 20 June 2010. ^ Human Development Indices Archived 19 December 2008 at the Wayback Machine, Table 3: Human and income poverty, p. 35. Retrieved on 1 June 2009. ^ "Female genital mutilation and other harmful practices". World Health Organization. Archived from the original on 12 October 2014. Retrieved 28 August 2014. ^ "Country Comparison :: Maternal Mortality Rate". The World Factbook. CIA.gov. Archived from the original on 18 April 2015. Retrieved 12 February 2015. ^ "Country Comparison :: HIV/AIDS – Adult Prevalence Rate". The World Factbook. CIA.gov. Archived from the original on 21 December 2014. Retrieved 12 February 2015. ^ "Population, Health, and Human Well-Being-- Côte d'Ivoire" (PDF). EarthTrends. 2003. Archived from the original (PDF) on 11 May 2011. Retrieved 6 December 2010. ^ a b c Essegbey, George; Diaby, Nouhou; Konté, Almamy (2015). West Africa. In: UNESCO Science Report: towards 2030 (PDF). Paris: UNESCO. pp. 498–533. ISBN 978-92-3-100129-1. Archived (PDF) from the original on 30 June 2017. Retrieved 24 August 2017. ^ Timms, Ryan. "Project Cote d'Ivoire". Project Cote d'Ivoire. Archived from the original on 6 March 2019. Retrieved 3 March 2019. ^ a b c d "Ivory Coast, Côte d'Ivoire: Cuisine and Recipes." Archived 22 May 2011 at the Wayback Machine Whats4eats.com Archived 14 July 2011 at the Wayback Machine. Retrieved June 2011. Auzias, Dominique; Labourdette, Jean-Paul (2008). Côte d'Ivoire. Petit futé Country Guides (in French). Petit Futé. ISBN 9782746924086. Blanchard, Pierre (1818). Le Voyageur de la jeunesse dans les quatre parties du monde (in French) (5th ed.). Paris: Le Prieur. Chisholm, Hugh, ed. (1911). "Ivory Coast". Encyclopædia Britannica. 15 (11th ed.). David, Philippe (2000). La Côte d'Ivoire (in French) (KARTHALA Editions, 2009 ed.). Paris: Méridiens. ISBN 9782811101961. Duckett, William (1853). "Côte Des Dents". Dictionnaire de la conversation et de la lecture inventaire raisonné des notions générales les plus indispensables à tous (in French). 6 (2nd ed.). Paris: Michel Lévy frères. Homans, Isaac Smith (1858). "Africa". A cyclopedia of commerce and commercial navigation. 1. New York: Harper & brothers. Lea, David; Rowe, Annamarie (2001). "Côte d'Ivoire". A Political Chronology of Africa. Political Chronologies of the World. 4. Taylor & Francis. ISBN 9781857431162. Lipski, John M. (2005). A History of Afro-Hispanic Language: Five Centuries, Five Continents. Cambridge University Press. ISBN 9780521822657. Plée, Victorine François (1868). "Côte des Dents où d'Ivoire". Peinture géographique du monde moderne: suivant l'ordre dans lequel il a été reconnu et decouvert (in French). Paris: Pigoreau. Thornton, John K. (1996). "The African background to American colonization". In Engerman, Stanley L.; Gallman, Robert E. (eds.). The Cambridge Economic History of the United States. 1. Cambridge University Press. ISBN 9780521394420. Vaissète, Jean Joseph (1755). Géographie historique, ecclesiastique et civile (in French). 11. Paris: chez Desaint & Saillant, J.-T. Herissant, J. Barois. Walckenaer, Charles-Athanase (1827). Histoire générale des voyages ou Nouvelle collection des relations de voyages par mer et par terre (in French). 8. Paris: Lefèvre. Wodié, Francis (1996), Institutions politiques et droit constitutionnel en Côte d'Ivoire (in French), Abidjan: Presses Universitaires de Côte d'Ivoire, ISBN 978-2-7166-0389-8, OCLC 37979208 Sykes, Tom (2016). Ivory Coast: The Bradt Guide. Chalfont St Peter, United Kingdom: Bradt. pp. 1–224. ISBN 1784770043. The only English-language guidebook to focus solely on Ivory Coast. Koudou Laurent Gbagbo is an Ivorian politician who was the President of Côte d'Ivoire from 2000 until his arrest in April 2011. A historian, Gbagbo was imprisoned in the early 1970s and again in the early 1990s, and he lived in exile in France during much of the 1980s as a result of his union activism. Gbagbo founded the Ivorian Popular Front (FPI) in 1982 and ran unsuccessfully for president against Félix Houphouët-Boigny at the start of multi-party politics in 1990. He won a seat in the National Assembly of Côte d'Ivoire in 1990. Félix Houphouët-Boigny, affectionately called Papa Houphouët or Le Vieux, was the first President of Ivory Coast, serving for more than three decades until his death. A tribal chief, he worked as a medical aide, union leader, and planter before being elected to the French Parliament. He served in several ministerial positions within the French government before leading Côte d'Ivoire following independence in 1960. Throughout his life, he played a significant role in politics and the decolonization of Africa. The First Ivorian Civil War was a conflict in the Ivory Coast that began in 2002. Although most of the fighting ended by late 2004, the country remained split in two, with a rebel-held north and a government-held south. Hostility increased and raids on foreign troops and civilians rose. As of 2006, the region was tense, and many said the UN and the French military failed to calm the civil war. Alassane Dramane Ouattara is an Ivorian politician who has been President of Ivory Coast since 2010. An economist by profession, Ouattara worked for the International Monetary Fund (IMF) and the Central Bank of West African States, and he was the Prime Minister of Côte d'Ivoire from November 1990 to December 1993, appointed to that post by President Félix Houphouët-Boigny. Ouattara became the President of the Rally of the Republicans (RDR), an Ivorian political party, in 1999. 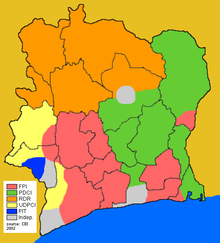 The Ivorian Popular Front is a centre-left, democratic socialist and social democratic political party in Ivory Coast. Throughout the Cold War, Ivory Coast's foreign policy was generally favorable toward the West. In particular, Félix Houphouët-Boigny kept relations with France that was among the closest between any African country and a former colonial power. The country became a member of the United Nations at independence in 1960 and participates in most of its specialized agencies. It is also an associate member of the European Union. In general, President Bédié initiated and maintained relations with many countries of the European Union and Asia. Ivory Coast maintains a wide variety of diplomatic contacts. Simone Ehivet Gbagbo is an Ivorian politician. She is the President of the Parliamentary Group of the Ivorian Popular Front (FPI) and is a Vice-President of the FPI. As the wife of Laurent Gbagbo, the President of Côte d'Ivoire from 2000 to 2011, she was also First Lady of Ivory Coast prior to their arrest by pro-Ouattara forces. Presidential elections were held in Ivory Coast in 2010. The first round was held on 31 October, and a second round, in which President Laurent Gbagbo faced opposition leader Alassane Ouattara, was held on 28 November 2010. Originally scheduled to be held in 2005, the vote was delayed several times due to the Ivorian Civil War and difficulties involved in the organization and preparation of the elections. A peace agreement between the government and the former rebel New Forces was signed on 4 March 2007, and in late April 2009, it was announced that the elections would be held by 6 December 2009, and that the date would be announced shortly. On 15 May 2009, the date was announced to be 29 November 2009. On 11 November, the elections were postponed again due to delays in the electoral roll. It was announced on 3 December 2009 to be held in late February or early March 2010. The 2010–11 Ivorian crisis was a political crisis in Ivory Coast which began after Laurent Gbagbo, the President of Ivory Coast since 2000, was proclaimed the winner of the Ivorian election of 2010, the first election in the country in 10 years. The opposition candidate, Alassane Ouattara, and a number of countries, organisations and leaders worldwide claimed Ouattara had won the election. After months of attempted negotiation and sporadic violence, the crisis entered a decisive stage as Ouattara's forces began a military offensive in which they quickly gained control of most of the country and besieged key targets in Abidjan, the country's largest city. International organizations have reported numerous human rights violations, and the UN undertook its own military action with the stated objective to protect itself and civilians. The Second Ivorian Civil War broke out in March 2011 when the crisis in Ivory Coast escalated into full-scale military conflict between forces loyal to Laurent Gbagbo, the President of Ivory Coast since 2000, and supporters of the internationally recognised president-elect Alassane Ouattara. After months of unsuccessful negotiations and sporadic violence between supporters of the two sides, the crisis entered a critical stage as Ouattara's forces seized control of most of the country with the help of the UNO, with Gbagbo entrenched in Abidjan, the country's largest city. International organizations have reported numerous instances of human rights violations by both sides, in particular in the city of Duékoué where Ouattara's forces killed hundreds of people. Overall casualties of the war are estimated around 3000. The UN and French forces took military action, with the stated objective to protect their forces and civilians. France's forces arrested Gbagbo at his residence on 11 April 2011.